PanARMENIAN.Net - Ameriabank on Wednesday, April 17 opened a news branch in the town of Abovyan in Armenia’s Kotayk province. 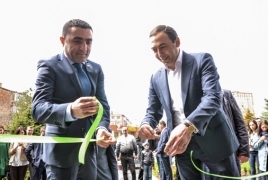 Kotayk governor Romanos Petrosyan, Abovyan mayor Vahagn Gevorgyan, customers of the bank, partners, other officials and guests were attending the opening. The Abovyan branch offers services on privileged terms to all individuals and legal entities who will become Ameriabank's customers by opening an account in the bank’s new facility by July 31, 2019. - Provision of one debit or credit card to individuals in case of opening a new account (except for Platinum or Infinite cards) with one year free service.